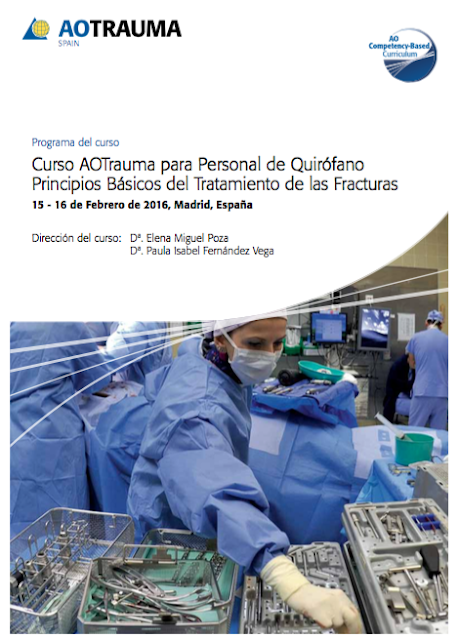 This year, the AO Trauma Course – Basic Principles of Fracture Management for Operating Room Personnel (ORP) will be held on 15-16 February 2016 in Melia Avenida de América Hotel (Madrid-Spain). It will be the first time that an AOTrauma Spain course is directed only by nurses. The faculty group will be composed of nurses and surgeons; they will work together to get a broad vision of caring for patients with fractures. The program for this course was reviewed and meets the criteria for the "AO Competency-Based Curriculum" stamp. The stamp shows our course participants and faculties that the course is a high-quality educational activity and part of a global curriculum. It indicates that the course content was developed in a careful planning process and approved by the AOTEC (AO Trauma Education Commission) based on an agreed framework of competencies and learning outcomes. This course will provide several evidence-based lectures. In practical exercises, participants will be trained in the application of fixation techniques and familiarization with the instrumentation. And discussions in small groups help participants to understand the decision-making process in fracture management and the importance of appropriate nursing preparations. Elena Miguel Poza Head of nursing in the IMTRA Incoma clinic in Madrid and specialised Traumatology and orthopaedic surgery nurse.